We aren’t vegans in my house but sometimes it is just so delicious to load up on veggies and eat light. This recipe passed the scrutiny of my meat eating hubby in the taste test kitchen. Plus, we all have Veganites in our lives and I love to keep it creative for them too! Begin by washing and drying all of your produce. Cut the little tomatoes in half. Any kind of tomato will do, whether sugarplum or cherry tomatoes it matters not, as long as they are small. Slice the radishes and avocado as thin as possible. Line up the romaine hearts on a dish, then start filling them up with your delicious veggie ingredients. 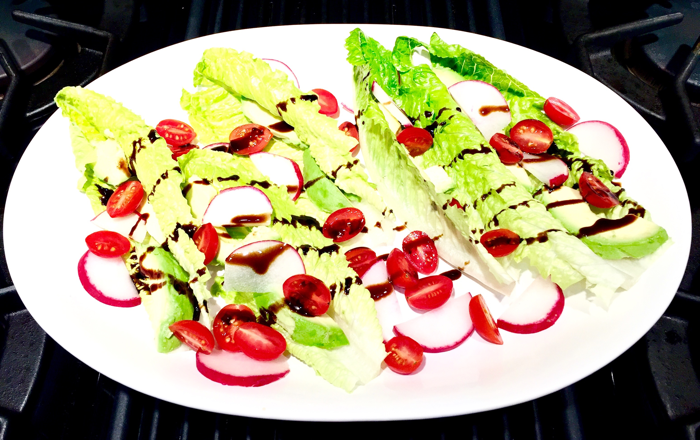 Once you have placed enough radish, avocado and tomato inside the lettuce cups drizzle over the top with Original Balsamic Vinegar by Leonardo e Roberto’s Gourmet Blends and your TomAvocado Lettuce Cups are ready to serve! Vegan, vegetarian, gluten free, dairy free, nut free, no cook recipe, appetizer, finger food, side dish.